Insurance is readily available. It’s the insights we offer that are rare. Get a deeper understanding of risk management and insurance with Schauer Group. 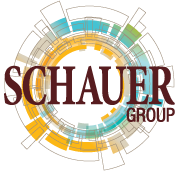 For businesses seeking precision risk management, Schauer Group is the risk, insurance, and human capital services team that delivers the most honest, expert and principled guidance because Schauer serves as a true extension of your leadership team. We develop strategies for your risk profile—a balance that requires industry intelligence, experience and an ongoing commitment to accuracy, accountability and process. Our industry-leading, 95-percent client retention rate is a reflection of our people and our approach. We focus on risk management, business insurance, employee benefits and human capital services, delivering financial stability to our clients through knowledgeable, dependable and honest service. We are celebrating 100 years of industry expertise in 2019. Schauer Group’s risk management process is an innovative approach to traditional insurance procurement, designed to uncover risk exposures from day-to-day business operations. Schauer Group’s business insurance service platform is for clients looking for more than simply a property and casualty insurance policy. Designed directly from the dynamic needs of our clients, we have adapted our strategic risk management process to assist you with outsourcing key HR functions. A Schauer Group employee benefits client is focused on long-term cost control—not just plan design and product shopping. Solid business relationships are built on a foundation of trust. At Schauer Group, we realize it is the trust clients put in us that makes us a leader in the surety industry, enabling us to provide a range of surety options to safeguard your interests.